Made for 2007 holiday gathering in State College. A hearty favorite! In large pot, cook sausage ~5 minutes. Remove meat and set aside. Add onion and garlic. Saute. Add broth, herbs, vegetables (except zucchini and spinach), and sausage. Bring to boil. Reduce heat and simmer uncovered ~30 minutes. 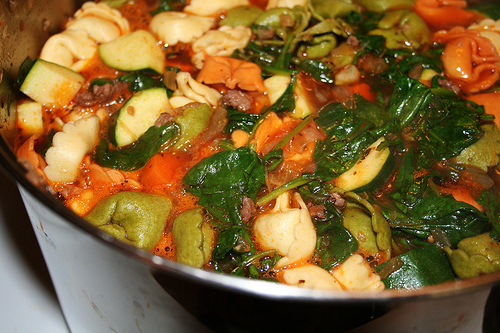 Add zucchini, spinach, and tortellini. Simmer ~25 minutes. Ladle into bowls, sprinkle with Parmesan, and serve with crusty bread.